Entomophagy is the widely popular practice of eating insects. When viewed from a nutritional and environmentally sustainable perspective, many leading scientists predict entomophagy to be the next big food trend. 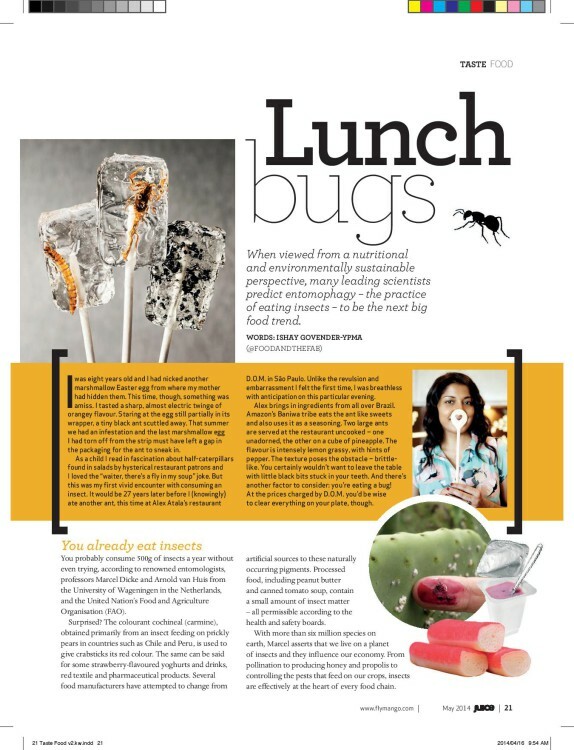 Ishay Govender-Ypma investigates entomophagy – insects as food and the future. I was eight years old, and I nicked yet another of my favourite marshmallow Easter eggs from the cupboard my mother hid them in, high above the stove. This time though, something was distinctly amiss. I tasted a sharp, almost electric twinge of orangey flavour and stared at the egg still partially in its wrapper. A tiny black ant scuttled away. I spat the marshmallow out in a panic, and yelled for my parents. That summer we suffered an ant infestation, and the last marshmallow egg I tore off from the strip in haste must have left a gap in the packaging and the ant snuck in. As a child I read in fascination about half-caterpillars found in salads by hysterical restaurant patrons and I loved the ‘waiter, there’s a fly in my soup’ joke, but this was my first vivid encounter with consuming an insect. It would be 27 years later before I (knowingly) ate another ant, this time at Alex Atala’s award winning restaurant D.O.M, in São Paulo. And unlike the revulsion and embarrassment I felt the first time, on this particular evening, I was breathless with anticipation. Atala brings in ingredients from all over Brazil, and the ant is one that the Baniwa tribe from the Amazon eats, like ‘sweets’. It’s used as a seasoning too. Two large ants are served, uncooked – one unadorned, the other on a cube of pineapple. The flavour is intensely lemongrassy, with hints of pepper. The texture poses the obstacle – brittle-like. You certainly wouldn’t want to leave the table with little black bits stuck in your teeth. And there’s the other factor to consider- you’re eating a bug! At the price tag charged by D.O.M though, you’d be wise to clear everything on your plate. Did you know, you probably consume 500 grams of insects a year, without even trying? According to renowned entomologists Professors Marcel Dicke and Arnold van Huis of the University of Wageningen in the Netherlands, and the United Nation’s Food and Agriculture Organisation (FAO), this is what the average Westerner consumes per annum. Surprised? The colourant cochineal (carmine) obtained primarily from an insect feeding on prickly pears in countries such as Chile and Peru is used to give crabsticks its red colour. The same can be said for some strawberry-flavoured yoghurts and drinks, red textile and pharmaceutical products. Several food manufacturers have attempted to change over from artificial sources to these naturally occurring pigments. Processed foods, including peanut butter and canned tomato soup contain a small amount of insect matter – all permissible according to the health and safety boards. With over six million insect species on earth, Dicke asserts that we live on a planet of insects, and they influence our economy. From pollination, to producing honey and propolis to controlling the ‘pests’ that feed on our crops, insects are effectively at the heart of every food chain. Now that you know you also consume insects, you’d be joining the two billion people, mainly in Asia, Africa and Latin America who seek out insects for food. Locally, we’re well acquainted with mopane worms or caterpillars, eaten by people living mainly in Limpopo and the North West. Dr Bronwyn Egan, a researcher on edible insects at the University of Limpopo, published a dissertation on the cultural and economic significance of entomophagy in Blouberg, a region in Limpopo province. “Insects are usually eaten in rural areas, not just because it’s a source of free food but because it’s tasty and perceived to be healthy. This is scientifically verifiable,” says Egan. When people move to the cities, they usually take their home-food longings with them, and the same can be said of mopane worm eaters. Harvesting and collection of mopane worms provides a vital source of income in some communities. With a protein content of 48–61 percent and fat content of 16–20 percent, of which 40 percent is essential fatty acids, the nutritional benefits are clear. I recall a recent encounter with insects’ eight-legged cousin, the a-ping, or Thai zebra tarantula, commonly available as a delicacy in Cambodia. 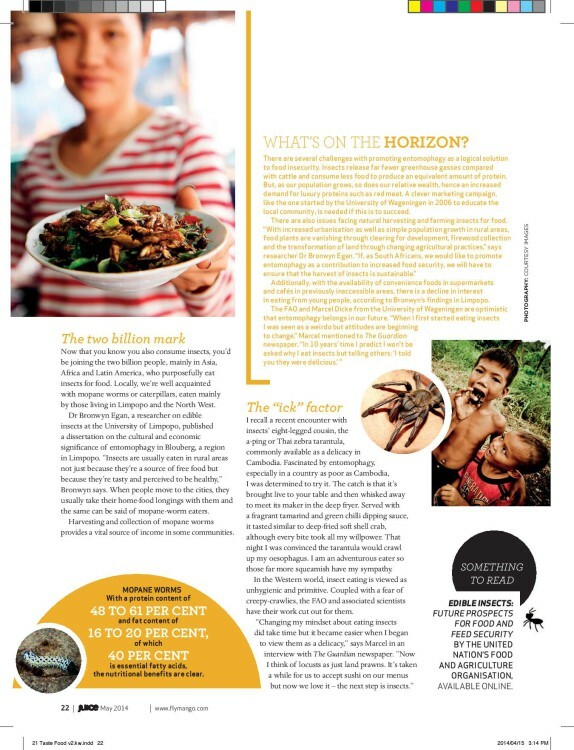 Fascinated by entomophagy, especially in a country as poor as Cambodia, I was determined to try it. The catch being, it is brought live to your table, and then whisked away to meet its maker in the deep-fryer. Served with a fragrant tamarind green chilli dipping sauce, it tasted very similar to deep-fried soft shell crab. Though, every bite took all of my willpower. That night I was convinced the tarantula would crawl up my oesophagus. I am an adventurous eater, so those far more squeamish have my sympathy. “Changing my mindset around eating insects did take time, but it became easier when I began to view them as a delicacy, something special to try. Now I think of locusts as just land prawns. It’s taken a while for us to accept sushi on our menus but now we love it – the next step is insects,” said Dicke in an interview with The Guardian newspaper. Challenges in promoting entomophagy as a logical solution to contributing towards food security and environmentally sound food production are several, and go beyond the human ‘fear factor’. Insects release far less green-house gasses compared to cattle and consume less food to produce an equivalent amount of protein, but as our population grows, so does our relative wealth, hence an increased demand for luxury proteins such as red meat. A very clever marketing campaign, like the one started by the University of Wageningen in 2006 educating the local community, is needed if this is to succeed. Additionally, there are issues facing natural harvesting and farming insects for food. “With increased urbanisation as well as simple population growth in rural areas, food plants are vanishing through clearing for development, firewood collection and the transformation of land through changing agricultural practises. If, as South Africans, we would like to promote entomophagy as a contribution to increased food security, we will have to ensure that the harvest of insects is sustainable,” says Egan. Additionally, with the availability of convenience foods in supermarkets and cafés in previously inaccessible areas, there is decline in interest in insect-eating from young people, according to Egan’s research in Limpopo.